As Cinco de Mayo draws near, you’re very likely to hear common Spanish words thrown into everyday conversations. Some words like tacos and burritos are so commonly used that they’re hardly considered Spanish any more. Others, like fiesta and amigo are Spanish basics that every American is familiar with. 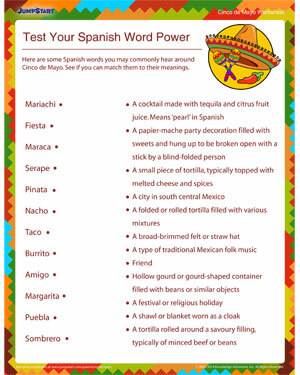 As the nation celebrates Mexican culture on Cinco de Mayo, use this vocabulary worksheet to see how much Spanish your students know.